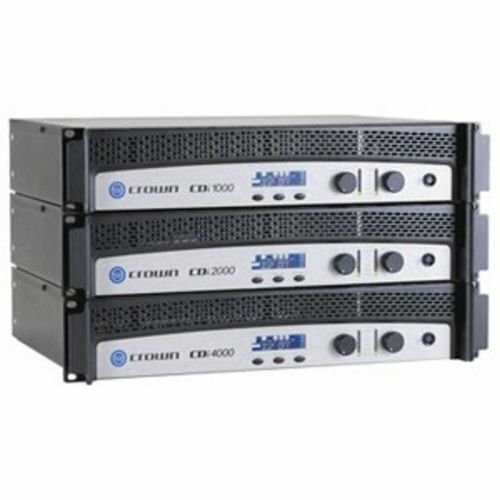 The Crown® CDi 4000 power amplifier is a professional tool designed and built for installed sound applications. Rugged and lightweight, it offers incredible value in its class. It features an intuitive front-panel LCD screen to guide installers through configurations, and also offers onboard DSP for loudspeaker signal processing. Other features include a switch-mode universal power supply, useful function indicators, proportional-speed fan-assisted cooling, removable Phoenix-style inputs, barrier strip outputs for low-Z or 70V/140V loads, short-circuit protection and more. Your investment in a CDi-Series amplifier is backed by Crown's Three-Year, No-Fault, Fully Transferable Warranty. "Accurate, uncolored sound with very low distortion for the best in music and voice reproduction Extremely versatile; rated for 2, 4, 8 ohm loads and 70V and 140V outputs Advanced protection circuitry guards against: shorted outputs, open circuits, DC, mismatched loads, general overheating, high-frequency overloads and internal faults Intuitive front-panel LCD screen for quick, easy configuration Switch-mode universal power supply Onboard digital signal processing include"
"Extremely versatile; rated for 2, 4, 8 ohm loads and 7V and 14V outputs "
"Advanced protection circuitry guards against: shorted outputs, open circuits, DC, mismatched loads, general overheating, high-frequency overloads and internal faults "
"Intuitive front-panel LCD screen for quick, easy configuration "